Two absolute legends in their chosen fields of racing come together at the 2009 Isle of Man TT. 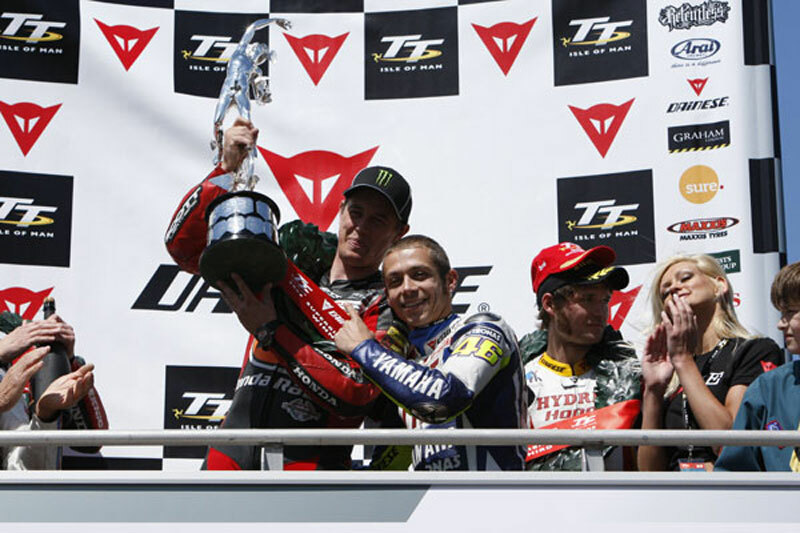 John McGuinness holds aloft the trophy he earned with victory in the Superbike race – his 15th TT win – and is congratulated by multiple MotoGP World Champion Valentino Rossi, making his first visit to the historic road race. This striking image, taken on the Superbike podium at TT 2009, records a wonderful moment in TT history, when two greats at the top of their game were brought together. The image was captured by Isle of Man-based Racing Pix, the company of respected photographer and lifelong motorcycle racing fan Steve Corlett. This image is printed onto high quality 375gsm, PH-neutral matte canvas approved to Fine Art Trade Guild and Wilhelm Imaging Research standards. Combined with the Epson pigment based inks, canvases are guaranteed to remain crisp and vibrant for more than 75 years. The canvas print is available in a variety of sizes - A0 (47”x33”/840mmx1188mm approx), A1 (33”x24”/594mmx840mm approx), A2 (24”x16”/420mmx594mm approx), A3 (16”x12”/297mmx420mm approx) and A4 (8"x12"/210mmx297mm approx). This image is also available as a mounted or unmounted print.